A kitchen, whether in home or café, is incomplete with a collection of good knives. Due to the variety of stuff to be cut, chop, and slice; it is essential nowadays to have the best kitchen knife for variety of purposes. This is irrespective of whether you are a rare cook or have the smallest kitchen. A good kitchen knife makes preparation quicker and tends to last for several years to come hence this guide on best kitchen knives. You may also find a few kitchen knives reviews towards the end of this guide. Tang as the blade’s extension reaching into the handle. Kitchen knives are available in a myriad of shapes and sizes. Of both, the shape is responsible for making the knife ideal for a specific job. When it comes to size, the measurement refers to the blade’s length from tip to heel. Well, you might prefer some purpose-specific knives or have just a handful to keep up with maximum tasks. Of all the factors, price is quite significant one. However, you need to know that while the price may vary significantly from one kitchen knife to another, you actually get what you pay for. The additional money brings to you primary features: Superior construction, better cutting performance, and more comfortable handling. An expensive knife features materials of superior quality throughout its body. Even the blade is composed of steel of higher quality, which usually passes through different processes for better cutting. Its sharpness tends to last longer than expected. It is vital to note that no knife stays sharp forever, but such a knife is easier to sharper than the more economical ones. Just as the blade, its handle is also made up of superior quality materials. In simple terms, the construction material for handle is more comfortable as well as durable. Such a handle is ensured convenience for longer period. However, you should choose a kitchen knife as per your requirements. These requirements will also help you in fixing a budget. Your requirements will mainly depend on how you cook and what you will frequently cook. If preparation is quite special, you can buy individual, but tailored knives for your task. For this, you will need to the different styles and types of kitchen knives along with the buying factors, which are listed below in this comprehensive kitchen knife buying guide. Well, there are different types of knives to consider for your kitchen. Some of them come individually, while some are a part of sets. A few of them are specialty knives. However, depending on your cooking needs, you may need some or all of them. Cook’s / Chef’s: Is the workhorse of any kitchen, as it is capable of making different cuts, dices, and slices of a myriad assortment of ingredients. It is an ideal choice for those who wish to buy only one knife. In fact, many people tend to buy more than one chef’s knife. Because it is a personal knife, its size should suit the cook. The standard size is 8 inches, which most cooks consider comfortable. However, a taller user will need a longer knife. In this case, consider a chef’s knife from upscale brands, which are available in sizes of 6 to 10 inches. A chef’s knife is also a utility knife with a pointed blade. It can be even 14 inches long and in length. Selecting the length is actually a matter of personal preference. If in doubt as the first time buyer, go for a middle option of 6.5 to 8 inches. In case you are more daring, a longer knife is fine, but you should know how to hold it right via pinch grip. Utility: Is thinner and shorter than a chef’s knife, but longer than a paring knife. It is a general purpose tool performing several tasks of specialized knives. This knife needs to be really sharp as well as retain an ideal edge, just as a chef’s knife. 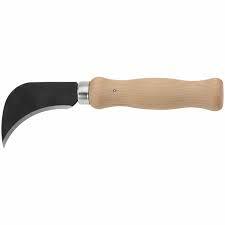 Turning: Has a short blade whose end consists of a downward point due to which it is ideal for peeling and turning different fruits and veggies in the typical French style. Paring: Is a short blade with length of a turning knife but has no downward point. As a result, it is best for intricate peeling of veggies and fruits, and mincing herbs. However, it needs to be truly sharp as well as maneuverable. Slicing: Is typically a thin and long knife with a smooth or scalloped edge that facilitates air flow between the contact points, enabling fine slices. The smooth edge is leaner than a typical chef’s knife, which contributes to very fine slices. Bread Knife: Is specially made knife for slicing bread without crushing it, which no other knife can ensure you. Such a knife is required to cut soft and hard crust. If you like crusty loaves, a serrated and sharp blade is essential. 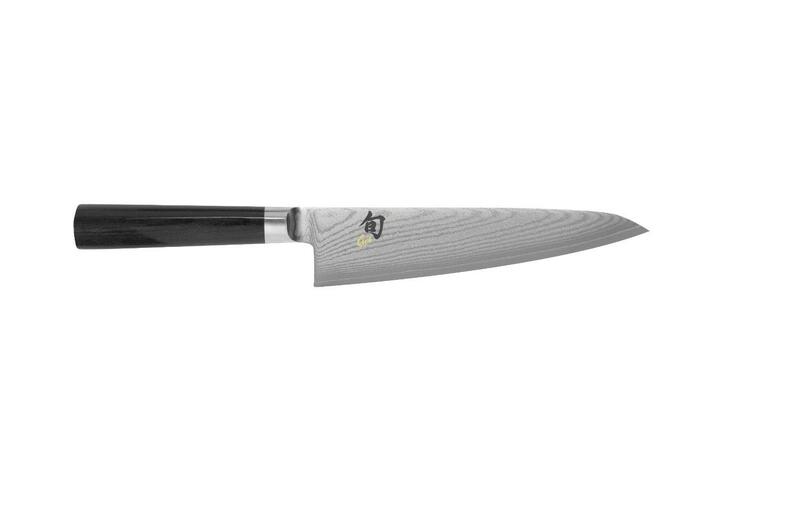 Santoku: Is a Japanese style utility knife, which helps in preparing a lot of vegetables. This one is a cross between a chef’s and a cleaver knife, as it has a straighter cutting edge than a chef’s and lighter than a cleaver. The former quality reduces the chance of rocking the blade for thin slicing. However, Santoku is preferable by those who are not used to rocking. Both Santoku and a chef’s knife perform a variety of tasks, but the former is ideal for straight chopping. Well but if the budget is there, consider investing in both. Cheese Knife: Is specially made for making items from cheese. A soft cheese knife has a serrated blade and holes that do not allow sticking of cheese. On the other hand, a hard cheese knife comes with a harder and thick blade for cutting parmesan and other such types of cheese. Sushi Knife: Is specially made for making sashimi or sushi. Sandwich: Possesses a smooth side for applying and dispersing butter and sauces as well as a serrated side for cutting via the filled bread. Of all these knives, the basic ones are chef’s, bread, and paring. A chef’s knife is a generic, big utility knife to do almost anything. A paring knife is a small one for delicate tasks and skinning veggies. These three knives are often a part of any kitchen knife set. 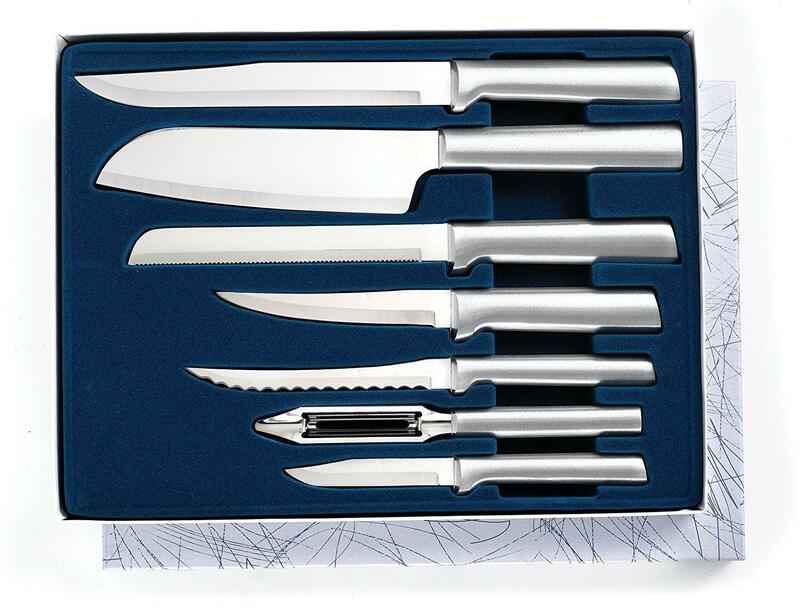 Often, people tend to invest in a knife set that can have most or all these knives. This is actually a cheaper way to obtain all these knives rather than purchasing them individually. However, you should look for the discussed below factors even while buying a set of kitchen knives. Further, you might not get a chance to take each knife in hand and feel it because of the prepackaged box or online shopping. In that case, it is best to confirm for return in case you do feel the knives comfortable in hand, which is tested just after delivery. All of these knives would need a sharpener or honer. So, you also need to consider buying a steel sharpener, electric honer, or a honing stone. You will find mainly two main styles in terms of makeup and cuisine and two styles in terms of blade’s edge. Each one differs in terms of looks and functions. Eastern or Western: Eastern-style knives have thinner blades but are produced using hard steel. This indicates that they are relatively lighter and need not be sharpened frequently. However, while sharpening, it can be a bit tough to reclaim the edge. The Eastern ones are ideal for more delicate tasks like sushi, while its sharper and lighter form is great for intricate cutting and slicing. On the other hand, western-style knives are composed of softer steel, which means they cannot retain their edge for longer. However, they are easier to sharpen as well as sustain. They have thicker blade, tang, and bolster, and possess more weight to confront heavy-duty chopping for Western cuisine. Smooth or Serrated: A kitchen knife with serrated blade possesses a smaller contact point on the area of cutting area. This allows it to apply more force on the surface, which is beneficial for cutting stuff that is harder on the exterior than the interior like fruits. Because of less point of contact, a serrate knife does not need to be sharpened so often. However, when it blunts, it is tougher to sharpen it than its smooth counterpart. On the other hand, a serrated edge is great for stuff firmer from outside, but they ensure good penetration into the tough exterior. It is long and is one of the two types: Narrow edge for veggies and fruits and wider for breads. Well, the weight needs to be such that it does not lead to fatigue if you will be using the knife daily. If light, such a knife is just fun and comfortable to use. Weight is a factor mostly for professionals, as otherwise one is less likely to use it long enough to get tired. Here also, there are two options: The conventional Western style and Japanese ‘WA’ handle. The former is most popular with full tang, rivets, and sturdy build. Full tang is known to offer more balance, making it simpler to rock while chopping. It gives one confidence of cutting even a tree with it, but that just about the look and feel. On the other hand, the Japanese handle is highly lighter and usually has half tang. This tang is responsible for lighter and suppler feel. In half tang, the blade reaches into the handle half way or even less, due to which the knife is lighter. A conventional handle is made up of two sections namely, the scales onto a solid tang. You may come across some knives whose handle is made using a single piece of plastic. However, not all such handles are of low quality. Well, there are three types to consider and select from. First is the edge ground blade having straight sides and an edge that is set (ground) into it directly. Second, the hollow ground blade is ideal for finer cut due to its concave, beveled edge. Third, the taper ground blade is known for its more stability as well as durability. It reduces from handle to tip in size as well as from the spine to edge. Usually, the blade of a kitchen knife is made up of steel. However, it needs to be of good quality. The standard steel is carbon steel that is sturdy but is not resistant to rusting. To replace this con, stainless steel came up, which you see almost in most kitchen appliances. Stainless steel is actually an alloy of iron, nickel, molybdenum, 10-15% of chromium, and small quantity of carbon. Its lower quality or grades does not offer edge as sharp as quality high carbon counterparts although they are highly resistant to corrosion. The stainless steel knives are usually stamped, not forged due to which they are highly affordable than the high carbon grade. These knives are highly useful as serrated blades but do not last quite long, as resharpening is not a good process in their case. However, stainless steel of better quality, especially with molybdenum tends to retain a good edge and do not virtually need maintenance. The best bet is perhaps the high carbon stainless steel. While carbon is responsible for strength, stainless steel is resistant to discoloration as well as rusting. However, much carbon makes the product susceptible to rusting and breakage. More carbon also does not allow for satisfactory edge retention but stainless steel does. However, you need to care of stainless steel or else it will rust. It is recommended checking out the VG-10, High Carbon, and Powder steels. High carbon stainless counterparts are considered as designer steels featuring a perfect balance of edge retention, sharpness, corrosion defiance, and easy resharpening. 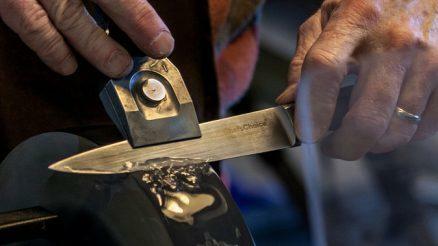 Most popular and esteemed brands such as Henckels, Wusthof, Global, and Victorinox offer blades of such steel. A few makers also have introduced their own proprietary blends with some variations in terms of strength and hardness. However, all of them are easy to use. A few Japanese models are crafted using highly engineered variations, which prove themselves sharper than carbon steel apart from longer edge retention. Blades of high carbon steel is either forged or stamped, re-sharpen well, resist corrosion, and retain their edge for a really commendable period. These blades also have a commendable visual charm. Many professional kitchen knives are constructed using a kind of high carbon steel. These knives only need hand wash and dry in terms of maintenance, of which drying is important to take good care of the handle. When it comes to a standard steel type for kitchen knives, nothing seems to take over the high carbon stainless steel. All three tend to hold the edge in a better way. In simple words, it eliminates the need to keep sharpening every time you need to use it. The newer steels are quite tough due to which they do not blunt as fast and consequently allows you to use it for months without sharpening. Another material for you to consider is zirconium porcelain (ceramic). Such knives are very hard (80+ being the Rockwell score), light, and yet very sharp. As a result, they tend to hold the edge for the longest possible time of all other blade materials. They were originally made to prepare sashimi or high quality. If adapted to a western style knife, you will take some time to get used to a ceramic blade, due to significantly lighter weight. The blades made from ceramic are non-reactive to chemicals due to which it will not change the taste or color of food you are handling with it. Another plus point is that these ceramic blades have no exclusive maintenance demands, except for taking care of not to bend or drop them as well as defend their edges when they are kept away. However, ceramic knives are subject to chipping, breakage, and shattering if it drops with intensity or is used rudely or abusively. Further, you cannot sharpen it using a home sharpener, due to its extreme hardness. This means it needs to be given to a specialist or its maker whenever there is a need of resharpening. Today, these knives do not leave any stain on ingredients and ensure the eventual cutting performance. The modern ones have become considerably stronger as well as more powerful but are not meant for preparing veggies of heavy root. Damascus blades are perhaps grabbing more attention from buyers due to their striking appearance. Kitchen knives with these blades are quite beautiful, with a blend of several steel clad layers around a core of hard steel for the edge. Damascus is actually not a material but an effortful and complex forging process due to which it is also known as pattern welded or laminated steel. In the process, layers of minimum two different steel styles are made by heat after which the layers take the shape of recurring folds. A normal blend consists of softer yet hard steel as the defensive or sustaining outer layers, and harder and sharper yet more delicate steel as the edge and core. Due to the presence of many distinct mixes of alloys and metals, it is not that easy to come up with a standard or rule regarding the maintenance of Damascus type blades. At present, the process of making Damascus blades is most common with Japanese makers of high quality knives. These makers specialize in creating models of carbon steel cores enclosed in alloy layers, which might not be stainless. However, the idea is to ensure that you are aware of the particular maintenance requirements for the outer blade and edge prior to investing in a Damascus style blade. If you choose a hammer forged kitchen knife, it is really a visual treat to have individual patterns formed by influencing the quarters of Damascus steel. In most kitchen knives, the damascus blade’s core is composed of powdered or VG-10 steel. When it comes to ranking in terms of performance, the damascus type falls behind. 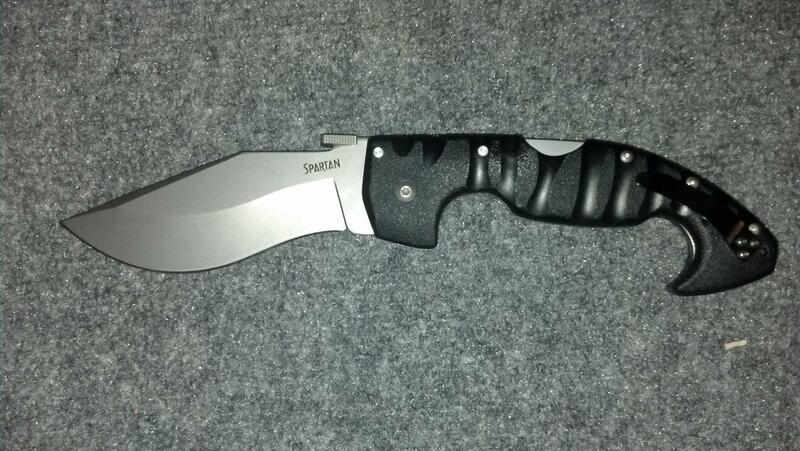 This is because it does not ensure sharpness or edge retention, unlike plain blade knives. So, it is for you to choose: aesthetics or functionality? This is either stamped or forged. The former one is cut through a steel piece and is less dense. It has the same thickness, but not at the cutting edge. While it does not have a heel and bolster, a stamped knife ensures good performance. It is also more economical than forged knife, although the most top-rated kitchen knives are forged. On the other hand, a forged knife is formed via repeated heating and cooling process. A single molten piece is beaten into the wanted shape. It is denser and is able to ensure better edge retention as well as balance. Such knife is pricier, but offers a sturdy blade with heel and heavy bolster for defending the hand at the time of cutting. It is less flexible and consequently less suitable to bend with time. No matter which kitchen knife you choose, there is no point in praising its high quality construction and durability if the blade does not have all essential qualities in it. The best blade is ought to be the one that is forged, is made using high carbon stainless steel, and has a full tang. Usually, the knives that meet the first two criteria are likely to have a full tang. In case of good quality kitchen knives, the handle is molded surrounding the tang such that the steel stretches in a single piece to the handle’s end in a visible way. Such an arrangement gives strength to the blade, which is enough to keep breakage away. In the absence of a full tang, the handle and blade are connected a bit loosely; it is just not a strong association. This can prove to be risky and render your knife useless once it cracks or breaks. Once you choose these three aspects of quality, it is time to check for safety aspects. You must be wondering why safety is considered secondary to blade here. Well, that’s because a sharp blade is always safe, but safety concern arises when it starts to become dull and fragile due to too much abuse or poor construction. Once a blade dulls and you apply a good amount of force for cutting, it simply increases the chance of pushing the blade toward your fingers or palm. Now, this is something that you would not like to experience or see. Thus, a blade getting dull can raise the chance of this safety breach. Similarly, you need to also consider handle when it comes to safety. A good quality handle is the one that fits well in the hand and does not compromise with the secure grip in wet or unfavorable conditions. So, you also need to check this out! Another safety feature to check for is a finger guard on blade, right by the bolster. This guard is an exclusively area that aims to defend the user’s fingers against slipping. However, it is worth noting that not all kitchen knives will come with a finger guard, which is not something to worry about. A big blade, such as the one in a chef’s knife, usually does not allow the blade to run into the bolster and a flat area exists to prevent a skin cut or any other harm. However, smaller knives can possess a sharper area that may cut your finger. Is Western style option for kitchens, with blade and bolster facilitating easy slices and cuts. It can even mince and dice all types of food. 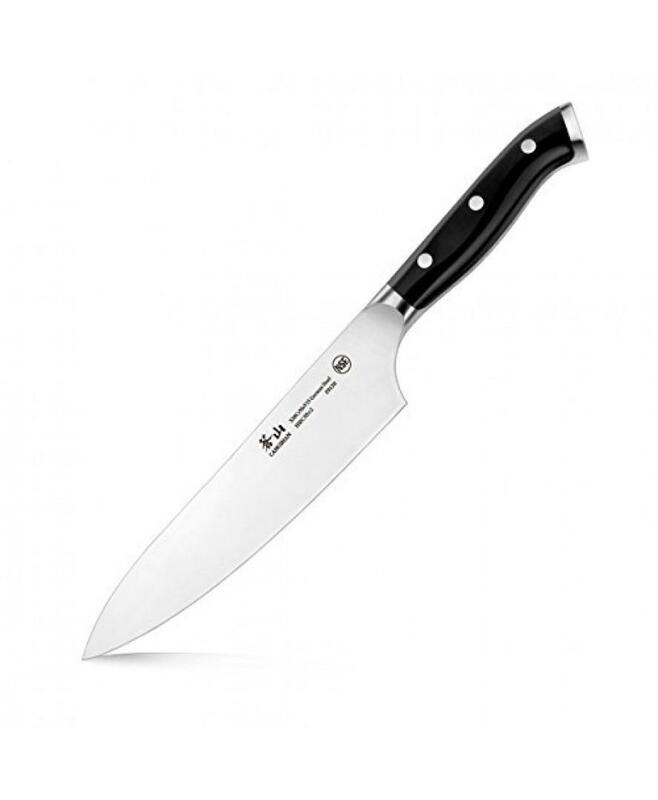 The knife features precision forged high-carbon stainless steel of German quality, double bolsters for control and balance, full tang, triple riveted handle for secure grip, and tested cutting edge. Another commendable point is the distinct compound angle, tapering from the spine to edge, enabling a sharp edge. It is only suitable for hand washing, not in the dishwasher. Is Japanese style option with bolster and thin blade (2.5mm) to cut and slice about anything. The contained dimples can even cut squash. It is very light but has a superb razor sharp edge gliding via vegetables as if they are there at all. The handle is made up of Pakka wood, which is resin-soaked wood adding to comfortable use. However, this knife is not dishwasher safe. Is forged, Japan-made knife that is big enough to handle big tasks such as splitting squash and balancing nicely for more delicate tasks. The blade, tang, and bolster have 33 layers of stainless steel, which gives you a Damascus rust-free and friction-free appearance reflecting strength and flexibility. The blade is made up of high-carbon VG-10 admirable for its edge retention and has a 16-degree angle for maximum sharpness. The dishwasher-safe Pakkawood handle is D-shaped, which fits nicely in hand. Hand washing is recommended. Is admired for its sensational slicing ability by professional chefs. It is light, rightly balanced, and has a razor-sharp blade. The blunt-ended blade is made up of CROMOVA 18 stainless steel and has a wide side for spreading sliced vegetables. The triangular handle made up of stainless steel and having dimples fits well for safe grip. The lightweight knife is only meant for hand washing. Offers high-carbon stainless steel blade made from a high-carbon steel piece hardened for lasting edge retention. The blade is such that it is even appreciable by a Viking soldier. The full bolster adds to balance while ensuring safety and control. The 15-degree angle and full tang ensures better handling. The handle is up of three-rivet polypropylene plastic ensuring a durable and firm grip. Its superb circular, chopping, and rocking capabilities are ideal for versatile preparations. Just keep in mind your tasks and it will be easy for you to get the best kitchen knife or knives! Although a single kitchen knife can be highly versatile, there is no saying when you would need a specialized model, say for, breads or herbs. So, it is best to have more than one kitchen knife.